Whether living on your own or in assisted care, a good doorbell can mean the difference between missing an important visitor or receiving a package. As ages get higher, so does the need for technology with louder sounds and more convenience.Take a look at some of the best doorbells for seniors and elderly folk. Which Doorbell Should You Buy? A classic intercom/doorbell piece, you can’t go wrong with this simple doorbell replacement for an existing system. If you’re looking for a doorbell with added security but one that is still easy to use, this M&S Systems Intercom Door Station piece is an excellent replacement for your typical doorbell. While a regular doorbell features a button on one side of the door with a ringing speaker on the other side, this doorbell and its system allow you to interact with whoeveris at your door via intercom. You will be able to speak to the person on the other side, letting you know who is ringing before you answer. 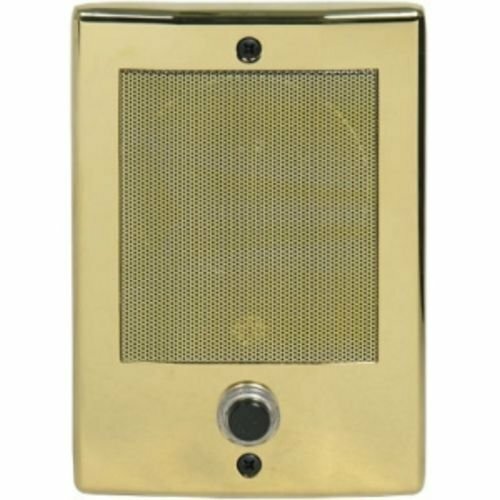 This intercom has a nice look and includes a lighted doorbellfor easy use. With just two wires rather than four or more used on other models, it’s also fairly easy to install. This doorbell is perfect for seniors who might live alone or would like an extra layer of security for any visitors at their door. It isn’t as foolproof as a doorbell system with a camera, but it’s also better for seniors who don’t want to fuss with the extra setup or technology that comes with a more enhanced system. We love the sleek design and simplicity of this set, and the fact that it is extendable to more buttons and receivers makes it that much better. At a great price point, this is a top-notch system. 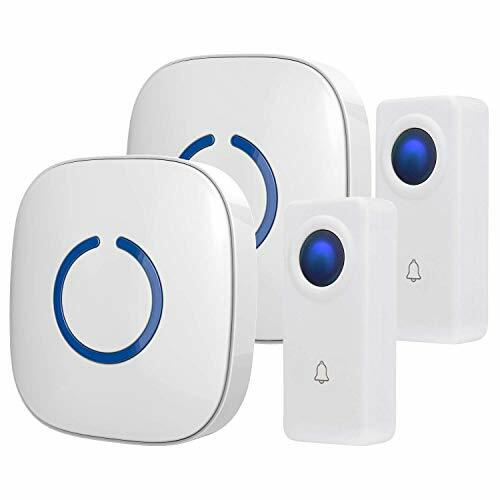 The SadoTech CrossPoint Wireless Doorbell Alert System is a high-tech, sleek system that lets you set up your doorbell system with a variety of customizable options, allowing for heightened security depending on what you choose. The starter pack includes two receivers and two transmitters. The transmitters are simple: they each have a button that sets off an alert on the receivers with a range up to 500 feet. The range of this wireless system is much greater than most models, so this also makes it a great option if you’re living in a large home. The transmitters can be placedwherever you choose—in fact, they’re waterproof, so weather isn’t a factor. If you have multiple entry doors, this is a great feature for added security and peace of mind. Even visitors at your back door will be required to make their presence known through this doorbell. This basic system is a great place to start, however,one of the perks of this system is that you can add more than 20 additional pieces including receivers, transmitters, and even motion and door sensors. While the base set is a doorbell system, it can be expanded to a security system too. Personalize your system by assigning a unique ringtone to each transmitter. The different sounds let you know which doorbell is being rung, or which sensor has been triggered. With a high range of volume adjustments, even those hard of hearing can appreciate this product. Because this sytem is completely wireless, it also allows for easy installation, even if you’re a senior living on their own. Excellent for those hard of hearing, this doorbell doesn’t just ring but flashes a bright LED light that you can’t miss. The setup is simple, and the light is very noticeable. 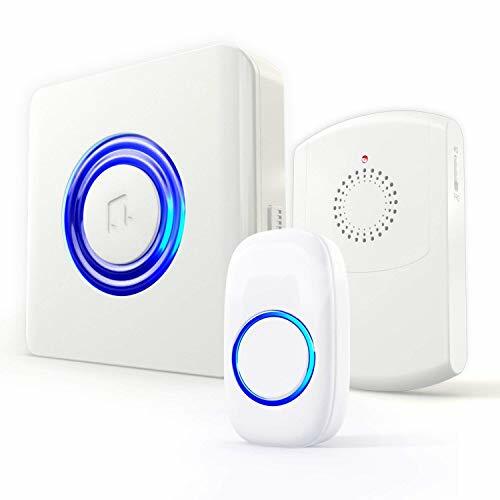 The Safeguard Supply Wireless Door Chime is an excellent choice for those who are hard of hearing. The doorbell uses not only a chimebut a bright LED strobe light that flashes anytime the button is pushed to alert you to a visitor at the door. Both sound and sight alert you of visitors quickly and efficiently. The wireless system is very easy to use and install. You should place the button where it can be easily seen by your door, while the wireless receiver plugs into any wall outlet. The range that the button will work with the receiver is about 150 feet. This system is expandable, meaning you can purchase extra chimes for multiple rooms or extra push buttons for multiple doors. You can customize each button, so you know which door your visitor is waiting behind. This is our favorite option for seniors who are hard of hearing. If you live alone or don’t always have assistance, the LED strobe light will still ensure that you’re alerted to visitors and can make it to the door in time to see who it is. This video-capable doorbell is an excellent security bonus, especially for someone who lives alone or unassisted. Simply use your phone to view who’s at your door through a WiFi connection. The Zmodo Smart Greet Video Doorbell allows you to answer the door from where ever you are using your smartphone. Through WiFi and internet connection, you can have on-demand access to live video of your doorway anytime you want. The HD wide-angle lens provides a clear picture. In fact,it uses smart motion detection to send you an alert and record a video clip whenever someone or something approaches your door. When someone is at your door, you can use the internet or your smartphone to not only see thembut speak to them. Thisis great for when you aren’t home or are not able to come to the door. 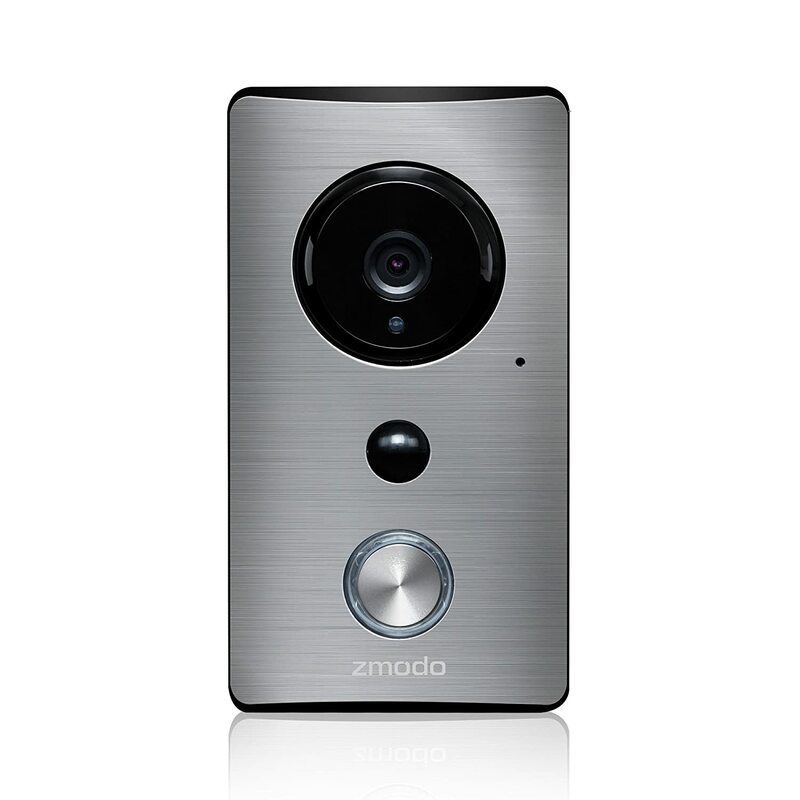 With the purchase of this video doorbell, you also receive Zmodo Cloud Service. Thisis an online storage service that will save all videos for 12 hours for free. This service is great for security, should there be a situation where you need to review who was at your door, or you simply aren’t able to greet them while they’re there. We recommend this product for seniors with limited mobility who aren’t always able to reach the door or have someone answer it for them. With the WiFi video and intercom system, you can see who is at your door and still communicate with them without having to get up. You can tell postal workers exactly where to leave packages, or let solicitors know that you aren’t interested without having to get up. Although this system is pricey, it works great and allows you to see who’s at your door with a large monitor screen. Through the intercom system, you can even communicate with guests, an added functionality that increases safety and security. 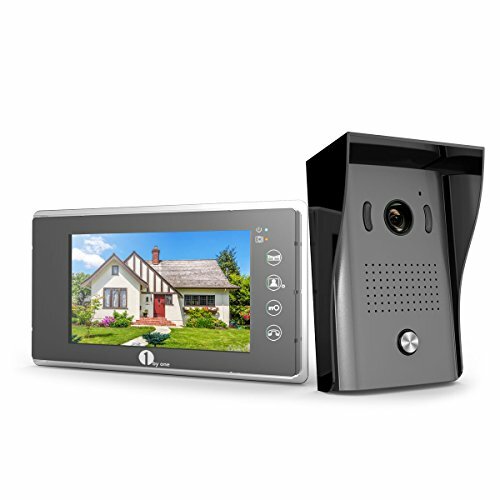 The 1byone Video Doorphone is an innovative system that not only alerts you when someone is at your door,but lets you see and speak to them. Using an HD camera, the outdoor doorbell camera gives you a clear view of who’s arrived and lets you speak with them from inside of the house. The two-wire system provides easy installation for no-headache use. The camera also features LED lights for great night vision. Asan added bonus, the device has a place for an SD memory cardso thatyou can record and save videos. Great for both security and alerting you that someone is at your door, this system is durable and will last through variousweather. In comparison to other video and intercom models, this system gives you the happy medium of added security without additional features like WiFi. If you’re looking for easy setup with the benefit of seeing your visitors on camera, this option is best for you. The portable receiver in this option is excellent for those who are hard of hearing. We love that you can take this receiver with you anywhere in the house and it will buzz when someone rings your doorbell. 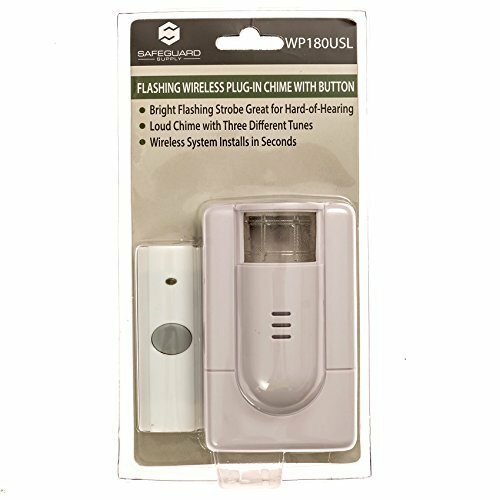 An award-winning doorbell designed especially for assisted living and special needs cases, the SadoTech Flashing Wireless Doorbell is an option you can keep with you where ever you are in your home. The base set includesone remote transmitter, one plug-in receiver, and one portable vibrating receiver. The transmitter button will send a signal to either one or both of the two transmitters, alerting you like a normal doorbell. However, the portable one is made to clip onto your belt, jeans, or somewhere more close and convenient so that even if you don’t hear the main receiver, you will feel the vibration and see the flashing lights of the portable one. This doorbell is excellent for those who are hard of hearing, blind, or forgetful. If you’re a caregiver but the senior you care for is home alone at times, this will ensure they’ll answer the door for you or other visitors. This clip-on receiver can also be used at times when there may be more visitors than usual coming in and out of the home, such as during the holidays. Those who live alone may find that the video camera doorbells provide them with an added layer of security. These videos basically act as a virtual peephole, allowing you to see who is at the door without having to get near the door. As you have seen in all of the options we’ve reviewed, there are a few different kinds of doorbells that are great for seniors and elderly folks. Which one is best for you? The answer to this question depends on your living situation, along with your personal preference and budget. Those who live alone may find that the video camera doorbells provide them with an added layer of security. These videos basically act as a virtual peephole, allowing you to see who is at the door without having to open the door. At times, some models also work via WiFi so you can see the video feed even if you’re away or can’t get to the door. Cameras are good for anyone who doesn’t necessarily feel safe answering their door for just anyone, or may have limited mobility to be able to get up and answer the door all the time. Additionally, cameras are great for people who still work and are out of the house often. You can use A WiFi-enabled camera for seeing people who come while you’re home, but it can also record those who arrive while you’re out of the house. Temporary or permanent storage will let you review footage from the day. Seniors living in an assisted care facility may feel safer and may not feel the need to have a video camera on their door. Additionally, seniors living with other family members may also feel safe enough not to opt for the camera. Loss of hearing due to age is a permanent condition that can’t be reversed. Signs of this can occur between the ages of 65 and 74. For this reason, some seniors like to invest in doorbells that are best suited to make up for this loss. Luckily, there are certain doorbells that have features to better equip the hard of hearing. Some of them utilize bright, flashing lights to gain attention from sight rather than sound. Different versions of these doorbells usually also offer multiple receivers for different rooms in the house. Those who have trouble hearing will see the flashing throughout the house and will know someone is at their door. Additionally, there are portable receivers that don’t make sound but vibrate and also use flashing lights. These receivers clip onto belts and waistbands so the wearer can feel it and know when someone is at the door. The sense of touch is used to replace the sense of hearing that may be at a loss. Regardless of the fancy features and sleek designs, the doorbell you choose needs to be what is best specifically for you and your needs. The choices we have provided you with today can help you along with your search. Consider your living situation. If you live alone, you may need more features to aid you versus someone who has a live-in caregiver or nurse who comes often. Your budget can also factor into the model that’s best for you. There are systems with added security features that don’t require you to break the bank or invest in features you may not use. Overall, make sure the system you choose can help you answer your door in the way that works best for you, while also keeping you safe.